High resolution ultrasound provides important additional information on the entire aspect of varying occurrences of focal neuropathies, e.g. nerve abnormalities, irritating structures, entrapment dependent on functional limb positions, different intraneural tissue reactions, extra- or intraneural space-occupying lesions, intramuscular reactions, and differential-diagnostically important inflammatory diseases. Continuous examination of the entire nerve is possible as well as its dynamic assessment during active and passive limb or muscle movement. There are no side effects and no contraindications. Children can be examined pain free. The method is more and more easily available and less cost- and time- consuming than MRI. Limitations only result from deeply situated nerves, obese patients and the phenomenon of acoustic shadowing; osteosynthesis material, hematoma and scar tissue formation can hide small nerve structures from detection. Furthermore, not to be neglected, the method depends on the learn curve and the final experience of the examiner. 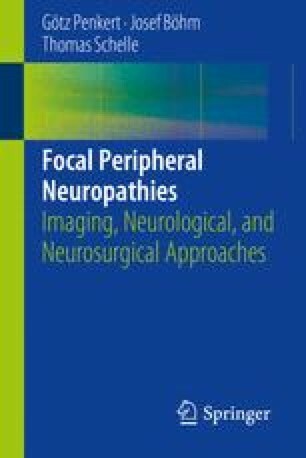 On the other hand, magnetic resonance neurography also provides some important additional information for assessing the diagnosis and differential diagnosis of focal neuropathies. Especially deep situated structures of the peripheral nervous system such as the lumbosacral plexus and the intrapelvic part of the sciatic nerve can be examined with greater accuracy than in high resolution ultrasound. We cover high contrast resolution and the capacity to administer contrast agents. However, MRN is not applicable in obese patients and in patients with a pacemaker or cardiac defibrillator, and is also difficult to apply when dealing with children. The method is not available everywhere and is cost- and time-consuming. We especially thank Karsten Stock, MD, Department of Radiology and Neuroradiology, Dessau-Rosslau general hospital, for MRI images 6.15–6.25 courtesy of Karsten Stock, MD. Sugimoto T, Ochi K, Hosomi N, Mukai T, Ueno H, Takahashi T, Ohtsuki T, Kohriyama T, Matsumoto M. Ultrasonographic reference sizes of the median and ulnar nerves and the cervical nerve roots in healthy Japanese adults. Ultrasound Med Biol. 2013;39(9):1560–70. doi: 10.1016/j.ultrasmedbio.2013.03.031. Epub 2013 Jul 3. Żyluk A1, Walaszek I, Szlosser Z. No correlation between sonographic and electrophysiological parameters in carpal tunnel syndrome. J Hand Surg Eur Vol. 2014;39(2):161–6. doi: 10.1177/1753193413489046. Epub 2013 May 14. Van Den Berg PJ1, Pompe SM, Beekman R, Visser LH. Sonographic incidence of ulnar nerve (sub)luxation and its associated clinical and electrodiagnostic characteristics. Muscle Nerve. 2013;47(6):849–55. doi: 10.1002/mus.23715. Epub 2013 Apr 29. Schelle T, Böhm J. Die Rolle des hochauflösenden Ultraschalls bei der Diagnostik von traumatischen Läsionen peripherer Nerven, eine retrospektive Studie. Klin Neurophysiol. 2012;43(1). doi: 10.1055/s-0032-1301427. Zaidman CM1, Harms MB, Pestronk A. Ultrasound of inheritedvs. acquired demyelinating polyneuropathies. J Neurol. 2013;260(12):3115–21. doi: 10.1007/s00415-013-7123-8. Epub 2013 Oct 8. Pham M, Bäumer P, Meinck HM, Schiefer J, Weiler M, Bendszus M, Kele H. Anterior interosseous nerve syndrome: fascicular motor lesionsof median nerve trunk. Neurology. 2014;82(7):598–606. doi: 10.1212/WNL.0000000000000128. Epub 2014 Jan 10.